History/Mythology: Seraphinite got its name from the Greek word ‘Seraphim’ which means ‘Celestial beings with 3 pairs of wings’. The Seraphim are thought to be the highest order of Angels and Seraphinite got its name due to the silver slivers in the stone that resemble Angels wings. Seraphinite has a wonderfully high vibration and is thought to assist one when working on a path to move to the next level of being. It is a very spiritual stone and can assist you to find your true spiritual path by strengthening your connection to your spirit guides. Due to its colour and earthy vibration Seraphinite tends to have a very strong connection to the Devic Realm (Nature Spirits) as well and users might find it beneficial to meditate or work with it out in nature. Seraphinite has such a strong vibration that it can affect not only the wearer of the stone but also those in its vicinity. It also helps to clear energy blockages from the body and strengthens ones Auric Field. Seraphinite is also a very protective stone as it helps to strengthen and keep a stronger bond with higher vibrational been so that they can ‘watch over you’. 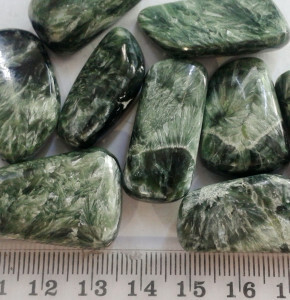 Seraphinite has a strong connection with the divine Being and as such with help the wearer to connect more with love of all things or Universal Love. Healing – DNA, Heart issues, detoxification process, Activates the spinal cord, release muscle tension, overcomes chills and promotes weight loss and promoting a healthy immune system. Seraphinite should be worn for a long periods of time in direct contact with the body to help strengthen and clear the Aura. Can be used in all meditations particularly when connecting with higher vibrational beings or someone wanting to progress spiritually. Seraphinite is a wonderful healing stone that can strengthen and fasten the healing progress – great stone for light workers. Great to use in healing any issues of the heart by placing a piece over the heart during helpings.